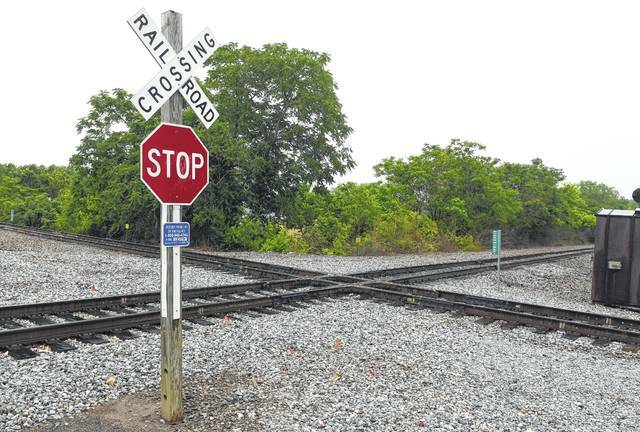 The Sugar Street railroad connection is at the heart of $2.1 million railroad infrastructure project described as a “linchpin” to helping alleviate stationary trains blocking crossings, particularly on Lima’s east side. LIMA — A $2.1 million railroad infrastructure project is being described as a “linchpin” to helping alleviate stationary trains blocking crossings, particularly on Lima’s east side. Ohio Rail Development Commission Executive Director Matthew Dietrich outlined the details of the project Wednesday at Lima Mayor David Berger’s weekly news conference. The project centers around an interchange near Sugar Street where the north-south Indiana and Ohio railway an the east-west Chicago, Fort Wayne and Eastern railways intersect. An interlocking is designed to use signals to prevent trains from colliding at intersections. Dietrich said the circuitry at the Sugar Street interlocking is antiquated and has been in need of replacement. The installation of new circuitry would allow trains to notify the interlocking of their approach while still outside the city. In the event of another train blocking the interchange, that train can stop and wait while still outside city limits and away from crossings. Additionally, the project would include installing a connection track in the northwest quadrant of the interchange, permitting easier transitions from one railway to the other. The commission had unsuccessfully attempted to obtain a grant for the project. However, the most recent transportation bill gave the commission additional financial flexibility to fund the installation. Lima City Council will vote Monday on legislation to grant an easement of 0.1 acres of city-owned property for the project, which is set to begin in the fall and be completed either by the end of the year or next spring. Reach Craig Kelly at 567-242-0390 or on Twitter @Lima_CKelly.